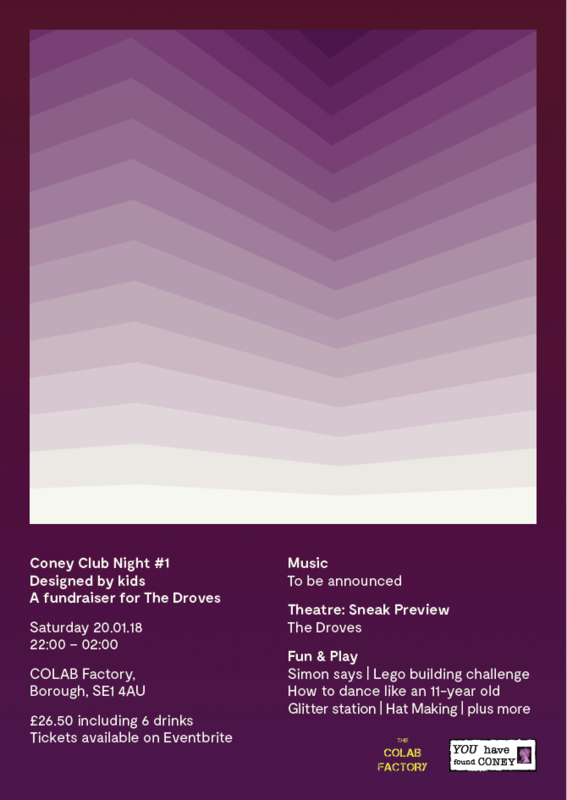 We are incredibly excited to announce tickets are now on sale for the Coney Club Night #1 – Designed by kids. If you’re on our mailing list (join here if not), you will have received a SAVE THE DATE but it’s official and it’s live. Yes that’s right, for the first time ever Coney are hosting a Club Night. You can expect a line-up designed by kids and curated by Coney, including music & DJ’s (to be announced), a sneak preview into the world of The Droves and more. Tickets are just £26.50 (Eventbrite booking fees apply) and for that you gain entry to an evening of fun, dancing plus 6 drinks. This event is fundraising for The Droves; Coney’s latest project with 7-11 year olds. We need a further £7,000 to complete the production, this night will raise £2,000. This is a Coney first and a new kind of fundraiser. All proceeds will go to the production. *Please note, this event is strictly over 18+ only.